February is planting month in Florida, assuming there are no more frosts or freezes expected. This year, we hardly had a winter, with only a handful of cold days, so I kicked into full gear and set out to plant my first garden since retirement. I mentioned in an earlier post that I’d carefully filled cardboard egg cartons with soil and sewn my seeds. 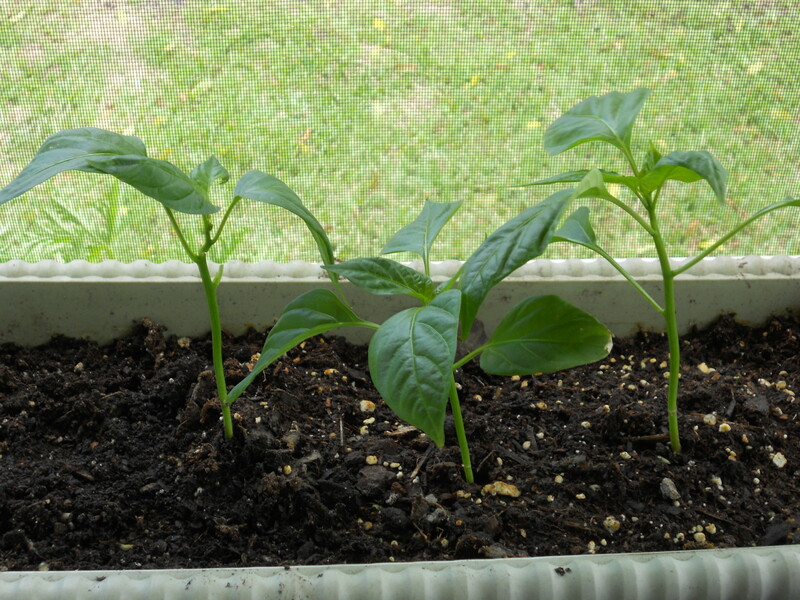 Within days, tiny shoots appeared, and in a few weeks, some gorgeous, healthy, green pepper plants swayed in the light breeze. I watered them religiously and fed them nitrogen-rich fertilizer weekly. I even talked to a few of them. (No one was around to witness that, so let’s keep it our secret.) As soon as they were big enough, I transplanted them into the container where I expected they’d spend the rest of their happy little lives. Soon after the plants were about two or three inches tall, I noticed one had been sheared off at the base, cut as cleanly as if someone had taken a pair of scissors to it. No obvious bugs were detected nor grandchildren around tall enough to be able to commit the crime. So I planted another bell pepper in its place. Days later, all were growing and doing well. Then, the “what-ever-it-was” struck again. This time it was a smaller plant in the same container. Replanted again. A few more days went by, and the little pepper farm thrived. This morning, all the pepper plants smiled, stood at attention, mouths open waiting for that good drink of water they knew was coming. A couple hours later, another casualty. “All right,” said I. “What’s going on here?” A little closer examination of the fatality and I spied the culprit, a three-quarter inch black and brown striped caterpillar, or worm or something. Since I’m not very fond of wiggly things, I didn’t pick it up to see if it had legs. However, I found a stick and lifted it from the soil and tossed it onto the cement pad just outside my back porch. And just to make sure it couldn’t find its way back to my pepper plants, I carefully positioned my shoe over the critter. Immediately, all that was left of it was a slimy green stain. “Ewww.” Yes, I agree. That’s kind of gross. But that rascal won’t be eating any more of my pepper plants! What is it that invades the garden of our life, threatening to seriously damage or destroy it? Are we being tempted with pride, jealousy, strife, gossip, disobedience, short temper? Lying, violence, immorality, the love of money? Unforgiving, unloving, unmerciful? Futile thoughts, foolish hearts, maliciousness? Let us always be on guard to identify those things with which the evil one will try to infect us. As soon as we recgonize a creature trying to steal our joy in the Lord, we need to crush it, just as thoroughly as that caterpillar. I don’t know about you, but with me, it’s a daily watch. This entry was posted on Saturday, March 31st, 2012 at 2:03 PM and is filed under INSPIRATIONAL. You can follow any responses to this entry through the RSS 2.0 feed. You can leave a response, or trackback from your own site. Very good analogy, Pat. I enjoyed this post. It’s timely, considering I’ve spent the last hour tilling my garden soil with my teenage son.